I finally did it! I made ketchup from fresh tomatoes! I had wanted to try this last year, but didn’t get around to it, so I’ve had to wait until tomatoes reappeared at the farmer’s market this summer. A more grown-up version of this ketchup could include cayenne pepper, a little ginger, molasses for sweetener and balsamic vinegar. But I wanted this to taste similar to the ubiquitous Heinz, in the hopes that Charlotte will actually at least try it, so I stuck to the “safe” ingredients in the bullet list. 1. Cut tomatoes in half. Place in a covered pot over medium heat for ten minutes. 2. Insert the disk with the largest holes into the food mill. 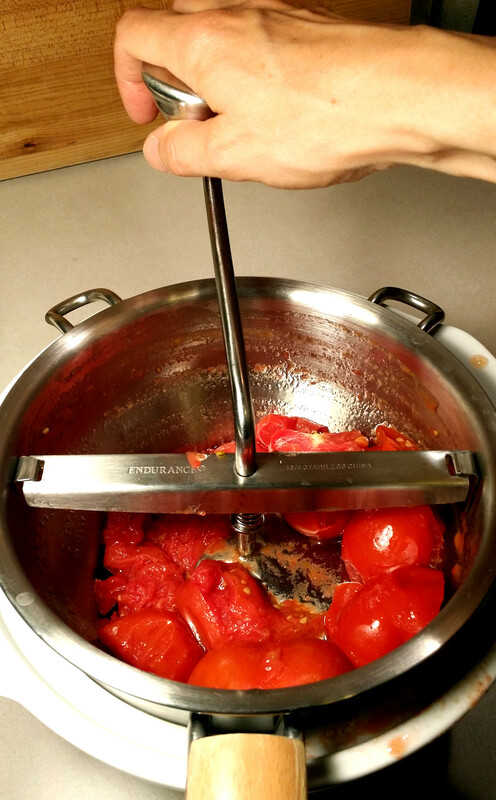 Place the food mill over a bowl and run tomatoes through it. I have to scrape the pulp off the bottom of mine occasionally or the disk clogs up. If you don’t want a vat of ketchup, set some of the tomato puree aside and use it for tomato sauce. 3. 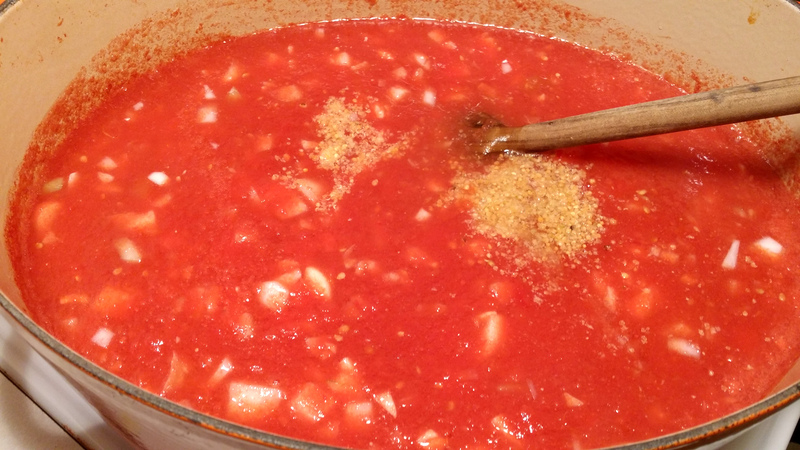 Mix the tomato puree with the remaining ingredients in a large pot. Simmer for an hour and a half, or until the mixture reduces by about a third. 4. That’s it! Transfer to jars. I did puree this a tiny bit with my hand blender, but I don’t think it’s necessary. If you don’t have a hand blender, I wouldn’t bother blending this. 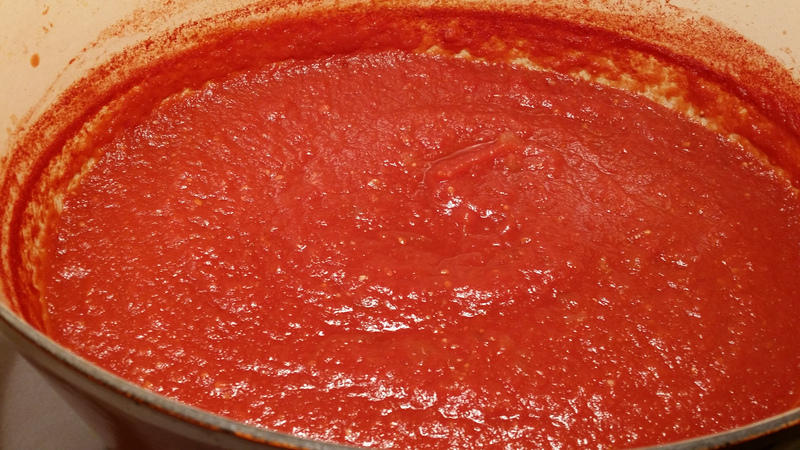 As you can see from the above photo, the red color intensifies as the ketchup simmers. The flavor does also. This didn’t taste nearly as sweet when I first mixed the ingredients together as it did after cooking. So, go easy on the sugar! I had hoped to can this, but I ran out of time. Besides, six pounds yielded five cups, a substantial amount, but perhaps not a break-the-kettle-out-and-transform-the-warmish-kitchen-into-the-first-circle-of-hell amount. I froze mine in small jars. Speaking of preserving, I realized after I made this that I could also have tried fermenting ketchup. It would still involve a lot of cooking time though, as I would need to reduce the tomato puree to almost a paste and let it cool before adding whey, salt, sweetener and spices. But that would be a fun recipe to try. And I think it would keep longer too. Although this does contain vinegar, it will spoil eventually (I would guess in a few months), unlike the commercial stuff. Not that I’m slamming my homemade ketchup! It tastes really good, both sweet and sour. The consistency differs from Heinz too. It has the texture of, well, tomatoes. But if Charlotte won’t eat this, I have a lot of perishable ketchup on my hands! I am envious that you have fresh tomatoes already. We are 6 weeks from ripe tomatoes here. Your ketchup looks delicious! Thank you! We are spoiled in California with the long growing season. I’ve seen hothouse tomatoes at the market for a while now, but held out for the real thing. It is always worth the wait! Great! I wish I could say I grew some of these tomatoes, but alas, I bought them all. This made quite a bit of ketchup (5 cups), so you could always cut the recipe in half if you prefer. I look forward to hearing how yours turns out! My mother once made her own ketchup – it was awful to my 6 year old palette who ate ketchup on everything at the time. I am still not fond of the taste of the homemade stuff, although my daughter has high hopes of converting me. If not converting, then shaming me into making it. I imagine most 6-year olds accustomed to ketchup would not convert to the homemade stuff. My 13-year old still hasn’t tried it but I haven’t given up hope. I had some on farmer’s market eggs this morning for breakfast, and that was pretty tasty. You’re welcome! I hope you get to those tomatoes too. I think my blog this month might be all red. My boyfriend just gave me a pile of heirloom tomatoes and I need to do something with them asap. What do you usually do with all of yours, besides ketchup this year 😉 ? I would like to ferment something. Maybe salsa. Well, since this is the first year *ever* that I have done this well with tomatoes, I don’t know…I was gonna ask you!!! 😉 Last year I made a very tasty cold tomato soup but I’m thinking salsa, caprese salad, alla checca with pasta, roasted tomatoes w/ thyme & olive oil, and just plain eatin’. (We have lots of grape tomatoes.) Fermenting is a good idea. I’ll take a peek in Sally Fallon’s book for some ideas. Happy harvest! Yum! All of those sound delizioso. Sally is a good way to go too. I love fermenting. It’s so easy compared to canning. I have a recipe on here for tomato sauce. It’s starts out the same way as the ketchup, so you could process a pile of tomatoes and use some for ketchup and some for tomato sauce. Happy tomato season! This looks amazing. We almost never eat ketchup but this might persuade me. Do you freezer the remainder of the batch? I think I’d also have to wait until I can grow enough of my own tomatoes to make it worthwhile on the flavour. Most tomatoes you can buy here taste terrible because they are basicaly unripe and artificially encouraged to turn red. Yes, I froze the remainder. Now I wish I hadn’t frozen so much of it because I would like to use some as a base for barbeque sauce (I have a really good recipe for balsamic vinegar barbeque sauce). 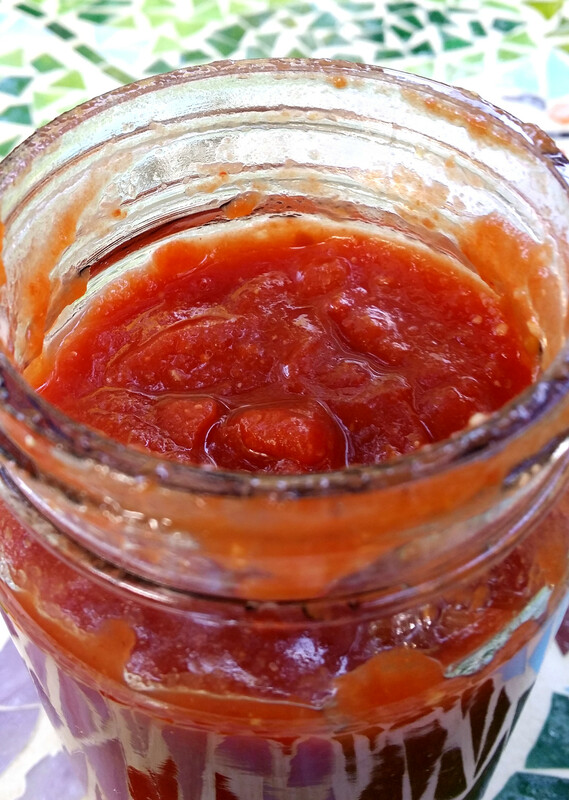 Homemade ketchup with homegrown tomatoes sounds ideal. I have heard horror stories about typical big ag tomatoes and it’s no wonder they have a mealy texture and zero flavor! Man that looks like a lot of work. Nice job!! Thanks! Yes, it was a lot of work. 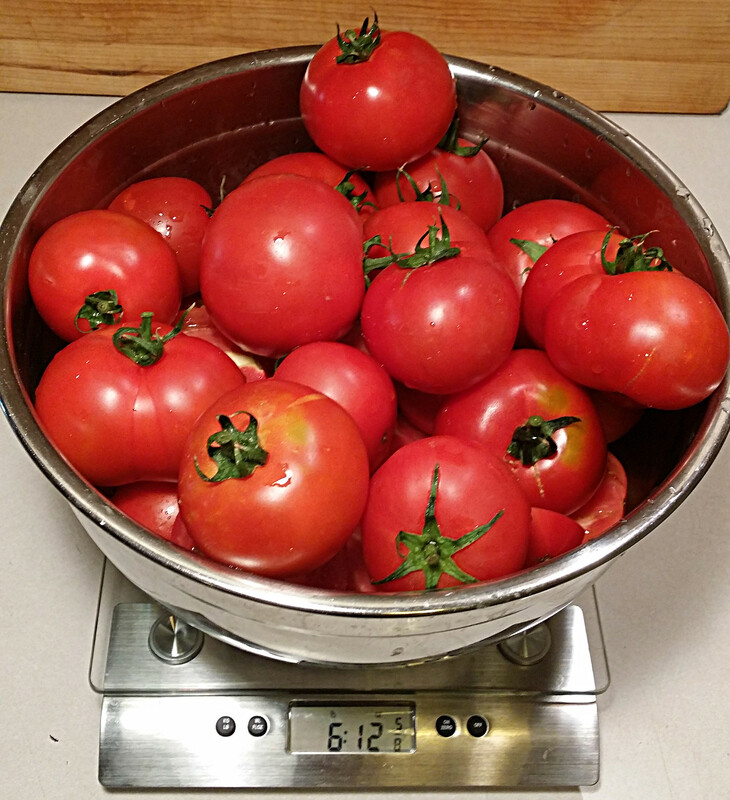 Processing the tomatoes through the food mill seemed to take longer than usual this time. It’s usually pretty fast. I think I just used so many that it kept clogging up a bit. Thanks for creating such an inspiring blog for us all to enjoy. 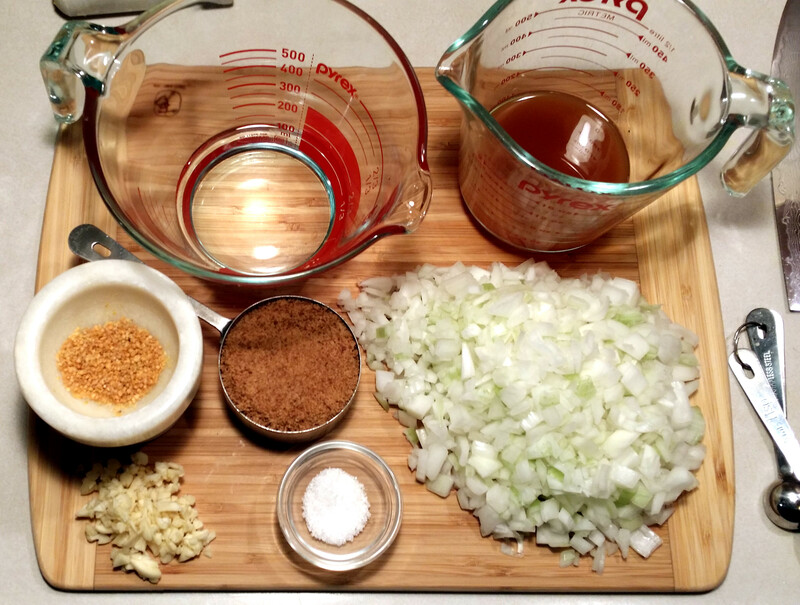 http://zerowastechef.com/ An amazing blog about cooking and reducing waste, something I am passionate about as well. We are kindred spirits in that regard. She has tons of useful information to share for taking baby steps toward a less wasteful lifestyle. An inspiring blogger who has lots of valuable information to share. I have nominated you for the very inspiring blogger award and you can find all the details here http://wp.me/p4rpUx-4R. This sounds awesome! I can’t wait to try this. I liked the recipe and would like to try it. 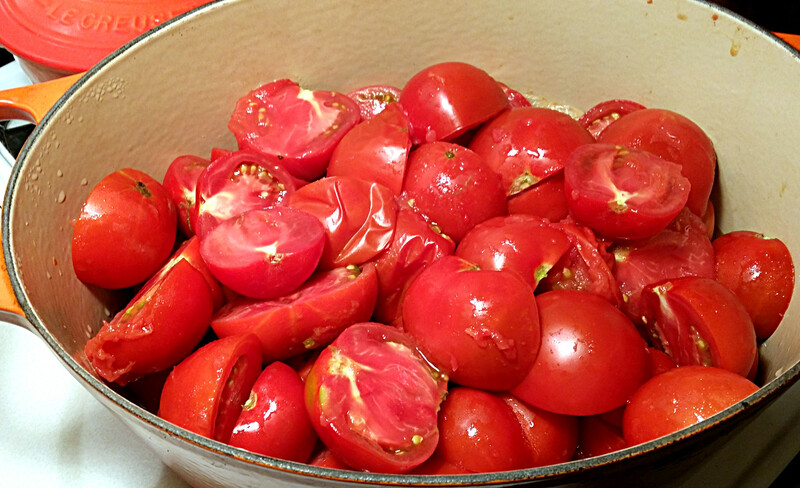 When you run the tomatoes through food mill, do you discard the tomato pills? Or it is soft enough by cooking to just goes through the food mill? Glad you like the recipe Vaishali 🙂 The food mill prevents the peels from going through. It works really well. You could also blanch and peel your tomatoes. Either method will work.